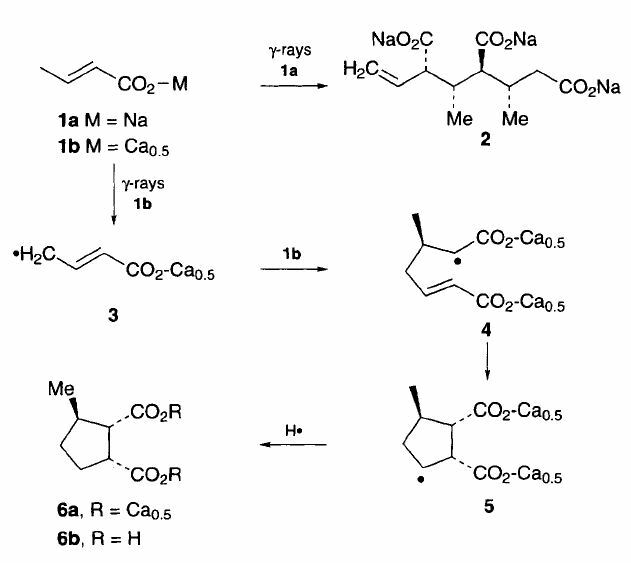 Oxidative free-radical cyclization of 4-(3-hexenyl)-4,5-dimethyl-1,3-cyclohexanedione (8) affords 85% of a diastereomeric mixt. 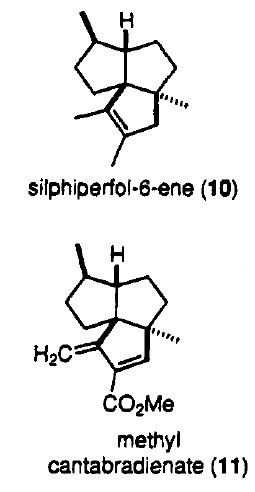 of bicyclic dione 7. Short sequences were developed to convert this mixt. 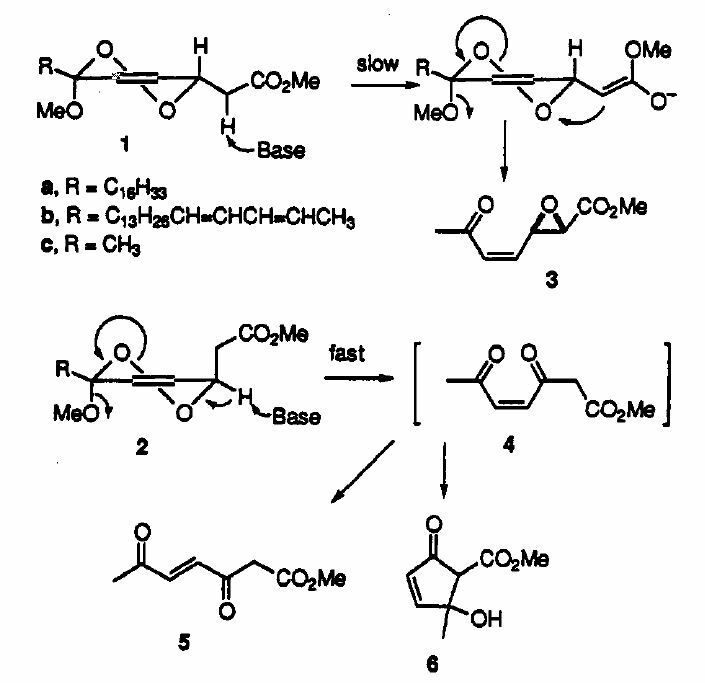 to carboxylate 2, a late intermediate in Taschner’s synthesis of upial. 165. Snider, B. B. “Thermal [2 + 2] Cycloadditions” in Methoden der Organische Chemie (Houben-Weyl) Vol. E21C; Georg Thieme Verlag, Stuttgart, 1995, Chapter 1.6.1.3. Oxidative free-radical annulation of dichloroacetophenone with terminal alkenes provides modest to good yields of 4-substituted 2,2-dichloro-l-tetralones (10), whose synthetic utility and reactivity is described. 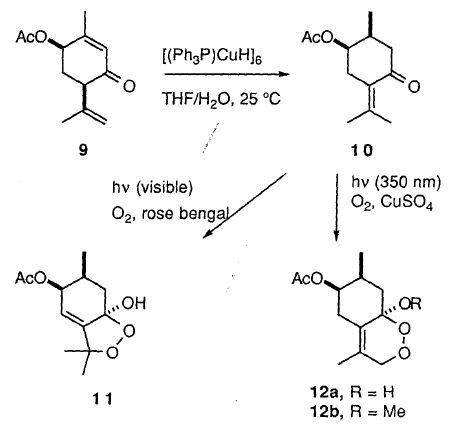 (−)-Acetylsaturejol (11) and (+)-isoacetylsaturejol (12a) have been prepared from (−)-cis-4-acetoxypulegone (10) by photosensitized singlet oxygen and non-singlet oxygen addition, respectively. Mn(III)-based oxidative free-radical cyclizations and addns. are versatile reactions that have been extensively developed over the past decade allowing free-radical cyclizations to be carried out without toxic tin reagents. Their applicability in large scale synthesis is limited by the requirement for ≥2 equiv of Mn(OAc)3 per mol of substrate oxidized. While manganese is not expensive, it is toxic, and the disposal of large quantities poses a pollution problem. 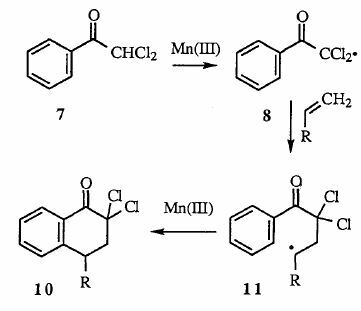 A variety of procedures were investigated to develop a cheap and safe method for reoxidizing Mn(II) to Mn(III) during the oxidn. of the org. substrate. 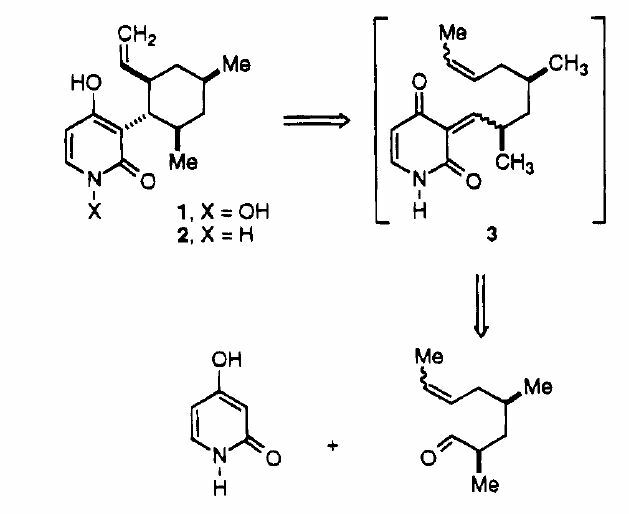 Successful results in some cases were obtained using anodic oxidn. to reoxidize Mn(II) to Mn(III) in a mixed solvent of AcOH and EtOH contg. NaOAc as an electrolyte. 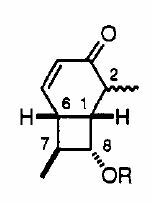 Sodium periodate in DMSO is also capable of reoxidizing Mn(II) to Mn(III).